The DrySyn MULTI system converts any standard hotplate stirrer into a reaction block for 3 flasks of 10ml � 100ml, or up to 12 vials. Its modular system offers flexibility and is very compact with a small footprint that is just a little wider than an average hotplate stirrer. The Asynt compact high pressure single reactors are designed for bench top use and allow for easy charging, product recovery, and cleaning. 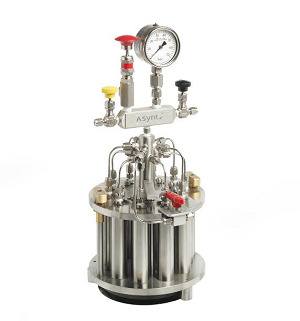 Designed to be used in conjunction with a simple bench top magnetic stirrer or stirrer/hotplate The Asynt Multicell Parallel High Pressure Reactor is a cost effective lightweight unit fabricated in 316 Stainless Steel suitable for numerous stirred or non stirred applications. These include hydrogenations and applications where air sensitive materials are used or any other reaction where pressure or temperature are required.